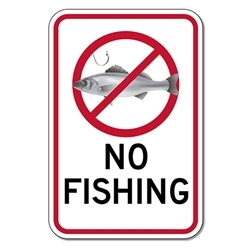 Our No Fishing signs remind people that it is prohibited and to fish elsewhere. Our rugged heavy-gauge aluminum No Fishing Signs have a full color fish image to catch everyone's attention. Our No Fishing are reflective and rated for 7-plus years of no-fade outdoor service. Have us add 3M Protective Overlay Film and your No Fishing Allowed signs will last for decades, as well as being protected from graffiti vandalism. If the sign is marked with graffiti, just wash it off using any mild detergent, and the sign face is undamaged. No time or money spent buying replacement No Hunting Signs and having to remove the ruined signs and install the replacement signs! DOUBLE the working life of your No Fishing signs by adding 3M Protective Overlay Film (POF)! 3M’s high-tech POF protects sign faces against fading caused by the sun and harsh weather—and makes graffiti and sticker defacement damage easy to clear away without harsh abrasives.